[prMac.com] Missoula, Montana - illumineX delivered EyeSpy 2.0.1 to the Mac App Store today, a new spin on the classic toy in which cartoon eyes watch your mouse cursor as you work. EyeSpy includes free original cartoon characters developed in cooperation with professional artists as well as new characters available as In-App Purchase. Collections of new characters known as ArtPaX are also available. All characters can be easily shared with your friends via Messages, Twitter, Facebook and any sharing platform supported by macOS. illumineX CEO Gary Longsine says, "EyeSpy is the result of applying decades of commercial software and enterprise system design experience to a free toy." The all new EyeSpy project began with a conversation about a curious problem and a crazy idea. The problem was that even after 15 years off the market, people still occasionally asked for an update to this fun bit of software. People missed the simple cartoon eyes watching their mouse cursor. 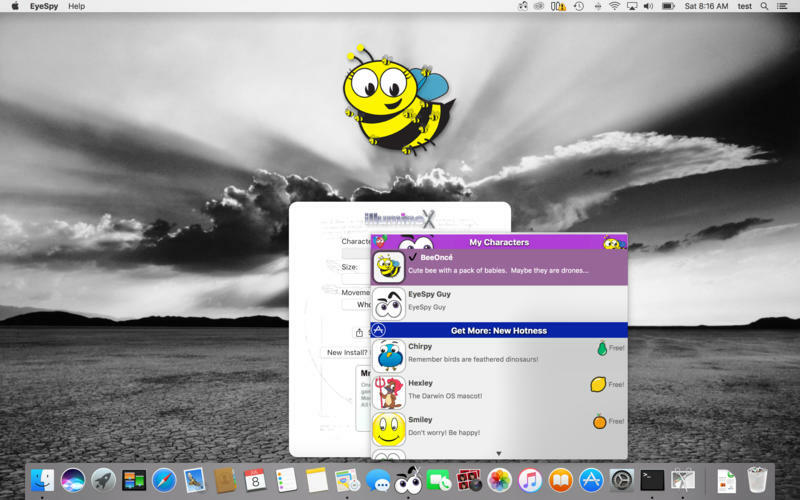 But EyeSpy needed more than merely to be modernized for current versions of macOS. The EyeSpy codebase hadn't been touched in 15 years. Merely making it build and run wasn't likely to scratch the itch. The crazy idea was to apply a modern enterprise design process to an old free toy, and completely rebuild it from the ground, up. illumineX began by setting a few goals for the project, similar to those a typical enterprise or government client might seek when refactoring an enterprise mobile app. Adding "cloud services" isn't enough. It's important to begin by re-thinking the app purpose and core requirements. illumineX set three top level goals for the EyeSpy project: Monetization, Gamification, and Technology refactoring. * Monetization - Make it possible for the application to support its own continued development, and more importantly support periodic refresh of the artwork in cooperation with professional artists. * Gamification - Make EyeSpy feel playful and fun, even though it doesn't have an objective. illumineX wanted EyeSpy to be a pleasant distraction, like playing with a rubber band on a phone call. * Technology Update - Build a foundation for EyeSpy for the next decade using modern tools including Swift, and modern API including SpriteKit and CoreAnimation. The result of taking EyeSpy through the same design, marketing, and engineering re-think process that illumineX use to help their clients is the all new product delivered this week to the Mac App Store. It takes quite a bit of effort required to make something seem simple, even when the starting point is a simple toy. Using the same Agile development process they use for clients, illumineX designed, prototyped, reviewed in marketing focus groups, and refactored through multiple development iterations. As you can see in the EyeSpy app today this process was able to produce an In-App Purchase experience which seamlessly integrates finding and purchasing new characters for the app. The Agile process was a key to successful development of the all new EyeSpy. illumineX CEO Gary Longsine said, "The final design of the In-App Purchase Store was very different and dramatically more effective than the originally specified design early in the project." The iterative design and marketing review process also revealed a fourth import goal: social media sharing. Sharing was the most requested feature from every focus group. illumineX showed early versions of the app to over 50 people and almost everyone asked the same question: How can I share the cartoons?Even though it wasn't originally specified, sharing was added as a top level goal for the project on the basis of this feedback. EyeSpy 2.0.1 is Free and available worldwide exclusively through the Mac App Store in the Lifestyle category. After you download EyeSpy, simply double-click the EyeSpy Guy character to open the Character Settings panel, where you can select new characters, download additional free characters, and purchase characters as an In-App Purchase. illumineX is available to help your enterprise or government organization rethink, redesign, and refactor your enterprise mobile apps. For more information, please contact Gary Longsine. illumineX helps enterprise, government, and startup clients design and build modern software solutions. Mobile and illumineX is committed to delivering quality software products for macOS and iOS. The App Store is the best resume. All Material and Software (C) Copyright 2017 illumineX, inc. All Rights Reserved. Apple, the Apple logo, iPhone, iPod and iPad are registered trademarks of Apple Inc. in the U.S. and/or other countries. Other trademarks and registered trademarks may be the property of their respective owners. "When we started out doing press releases we were using the using the traditional, manual way. Our response rate was about 0.1%. Not understanding what exactly we were doing wrong we came across prMac in a search query. Having nothing to lose we passed along the exact same press release that we had failed with along to prMac. We were subsequently blown away by the response within hours. I would say that prMac is probably the only feasible method of getting good exposure for a press release from most Mac or iOS software companies. With the value of service and support quality you get, the cost is also negligible in comparison to the value. Using prMac is a no brainer."